Favorite food: Dots (OK, that’s not a food, but these gum drops have been his favorites for years; he also enjoys nectarines and peaches). Favorite activity: Munching on the grapevines growing around his enclosure. Gibby is one of our wild caught gibbons who was bought by a scientist at Hofstra University on Long Island, New York in 1960. He was transferred to the State University of New York at Stony Brook sometime in the 1970’s where he was used in locomotion experiments. He was trained to run on a treadmill until he collapsed, wearing a harness, while measurements of his muscle movements were taken. This included anesthesia twice a day and insertion of electrodes into his muscles. These experiments were extremely hard on his body and as he got older they became increasingly stressful. In 2003 Gibby was transferred to a sanctuary in Texas when the lab decided to get rid of its gibbons. He was then brought to IPPL in 2007 when the Texas sanctuary fell on hard times and was paired with our lovely female Tong in February 2013. Despite the hardships he had to suffer before he came to IPPL, Gibby is one of the most loving gibbons on the property, as long as you’re female! We learned from one of his former caregivers at the lab that Gibby had always had a dislike for men and would become agitated if a man entered his room. She even saw Gibby get loose once and chase after, and corner, a male visitor. Whenever he escaped, the women staffers would run down the corridors yelling “The Gibster’s loose, the Gibster’s loose. Men, get into your office and lock the doors!” Here at IPPL he is always reaching out for and making excited vocalizations at our female animal caregivers and is always willing to participate in a luxurious grooming session. 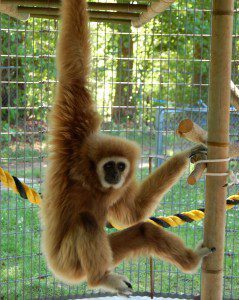 Even though he is one of the oldest gibbons on the property, and possibly in captivity, he is extremely active and can constantly be found wrestling with his mate, Tong. After a lifetime of uncertainty and stress, Gibby is one gibbon that is determined to make the most of his golden years in all the comfort, security and love we can give him.